One of the true characters of the wine industry, Geoff Merrill was born in 1953 and was raised on a sheep station in the far north of South Australia until he was 11 years old. The Merrill family then moved to the Barossa Valley where Geoff’s first links with the wine industry were formed. His formal education was gained at local Barossa Valley Schools and the Institute of Technology in Adelaide. From 1970 to 1973 Geoff undertook a winemaking traineeship at B Seppelt & Son. A position as Experimental Winemaker with Stellenbosch Farmers Winery lured him to South Africa for a year in 1974, after which he traveled through Europe. By the end of 1975 Geoff was back in Australia and had joined Chateau Reynella as Assistant Winemaker. In 1977 he was promoted to Senior Winemaker, a position he held until 1985. 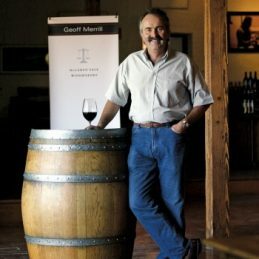 Whilst working a Chateau Reynella Geoff also managed to find the time to make wines under his own “Geoff Merrill” label. These wines were first released in 1983 with the 1980 Cabernet and 1981 Semillon. When Thomas Hardy & Sons purchased Chateau Reynella in 1982 Geoff stayed on, continuing to make the Chateau Reynella wines. By 1985 he had become a Consultant Winemaker for Hardy and Chateau Reynella’s red wines. At the same time he was on the lookout for a winery where he could base his own operations. He found the beautiful, but run-down, Mount Hurtle Winery in 1985, which he restored and by 1988 Geoff had left Hardy’s to run his own operation. Since 1988 Geoff has concentrated on the winery and his wines. He has continued to gain national and international recognition for his distinctive style of winemaking and his zest for life. September 1993 marked a new stage in Geoff’s winemaking career as he took up a position as a Consultant Winemaker in Italy to UK supermarket Sainsbury and Gruppo Italiano Vini in Italy. Geoff is available to speak at corporate wine lunch and dinners or to add as a highlight to your next event.